While the loss of a single tooth may not seem like immediate cause for alarm, it can have a domino effect regarding your overall oral health and function – that’s why Dr. Oshidar and the rest of our dedicated staff here at Roselle Park Dental & Implants would like to address the issue as soon as possible with a customized, high-quality single tooth implant. Dr. Oshidar is highly distinguished in the field of implant dentistry and is committed to using the most innovative technology in the field for these procedures. If you’d like to schedule a consultation, don’t hesitate to contact our Roselle Park, NJ location today! After we’ve determined that you’re a good candidate for the implant procedure, your new implant will be surgically placed within the jaw in order to create a new “tooth root” and better preserve the healthy bone. Then, once the natural tissue has successfully fused with the implant, a custom, all-ceramic dental crown will be attached over it in order to restore its natural appearance and strength without negatively affecting the surrounding natural teeth. How Much Does A Single Tooth Implant Cost? Dental implants should be considered a significant commitment of finances and time, but the health and aesthetic benefits patients receive in return are extremely valuable and long-lasting. The overall cost of a single tooth implant will depend on several factors, including the scope of your insurance coverage, your current oral health, the details of the procedure itself, and more. Please check out our specials! 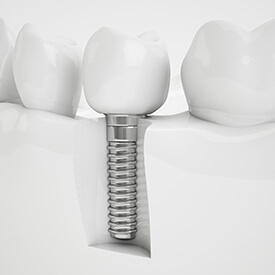 How Do Implants Compare to Bridges? While bridges have been considered a suitable tooth replacement for single missing teeth over several years, this type of restoration actually requires that adjacent natural teeth be significantly altered in order to support its fixed placement. Alternatively, dental implants are capable of replacing the single tooth without sacrificing the health or thriving structure of the teeth around it, which is much more ideal for your ongoing wellbeing. How Do Implants Compare to Partial Dentures? Partial dentures are a convenient and fast solution to the loss of a small amount of teeth, but they ignore the problem of the missing tooth root, only choosing to focus on replicating the crown that shows in your smile. As a result, the jawbone will start to deteriorate over time, which is why many older people with full or partial dentures end up with a facial appearance that is somewhat hunched. On the other hand, implants are designed to replicate the entire natural tooth and integrate directly with the jawbone, keeping the tissue healthy and intact for many years to come.